The effect of our mild winter has been discussed at length in newspapers and TV, and the appearance of snowdrops and daffodils much earlier each year gives witness to the changes that are occurring. The copse shows this in each of its three corners, where bulbs have emerged and buds appeared on the trees, and ground parsley starts to carpet the woodland floor. The birdlife is thoroughly busy too, food is abundant and the kinder temperature allows less migrations and an earlier courtship among all species. 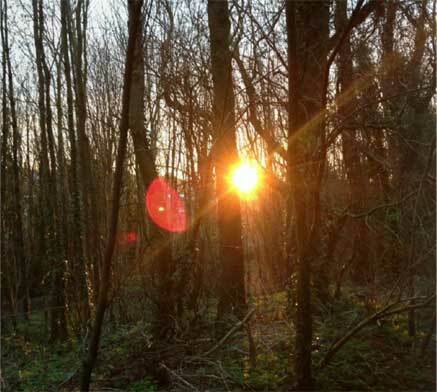 Just wander through the copse at daybreak or dusk and hear a cacophony of birdsong. That is, if the traffic noise from the by-pass is blown to a different direction. Earlier this month I spotted a green woodpecker drilling into one of the older trees in the very centre of the wooded area. At first I thought I'd heard an echo, as a more distant drilling noise answered the first. This repeated for several minutes, the question and answer of these two woodpeckers. The staccato rattling noise on the hollow wood bounced around the leafless copse, providing an unusual soundtrack to the walk that day. Some confusion still remains about the future of our ranger service provided by the council's parks department. Recent meetings of the council seem to have found surplus budget from some overpayments, which were proposed to be used to reprieve the rangers, at least for another year. But until the final budget meeting of the council takes place it remains to be seen if the council can support our Friends group activities. Without the rangers our activities will be less ambitious than ever before. Perhaps reduced to just picking up litter.